California Dreaming - the 11 day KeaRider motorcycle tour through California and Nevada will take you to the most beautiful places of the American West. You will ride along the famous Highway 1 from Los Angeles to San Francisco and discover the beautiful region of Big Sur. After a visit to San Francisco and the exciting ride on the Golden Gate Bridge you will discover the wine-growing areas in northern California and the artists town Mendocino before your road trip leaves California and heads south through the Nevada Desert. In Nevada, visit the gambling mecca of Las Vegas and discover the old Wild West in the ghost town of Calico with their closed down silver mine. 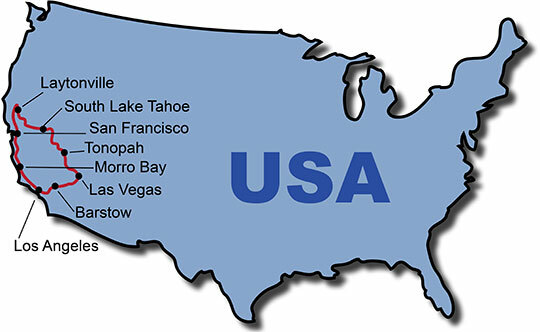 Your motorcycle tour through California and Nevada ends in Los Angeles. After an individual journey, tour participants meet in Los Angeles and head north on the Highway 1. You will comfortably cruise through Santa Monica, Malibu and Santa Barbara to the Danish influenced town of Solvang, and through green hills continue on to Morro Bay. Today, take the Highway 1 along the beautiful coastline of Big Sur over to Monterey and Half Moon Bay to San Francisco. You can see San Francisco in your own free time. For example you can visit the famous Alcatraz or explore beautiful neighborhoods such as Chinatown and Fisherman's Wharf. You will leave San Francisco and head north over the Golden Gate Bridge. Via the coastal village of Mendocino, you continue on to Laytonville. The beautiful clear lake in the Mendocino national forest awaits you this morning, before you ride through Sacramento and the gold mining town Placerville to the Eldorado National Forest and further to Lake Tahoe. We are riding through the Toiyabe National Forest toward Genoa, the oldest permanent settlement in Nevada and continue north to Carson City and Virginia City belonging to the gold rush time. You will get a Wild West feeling when you visit the many old ghost towns and gold mines in the desert of Nevada before you spend the night in the gold mining town of Tonopah. You cruise a further day along the highways of the Old West before reaching the glittering metropolis of Las Vegas in the evening, where your hotel awaits you. The day in Las Vegas is at your own disposal - visit the Hard Rock Cafe and try your luck in one of the many casinos. A last day of Wild West is on the agenda, the motorcycle tour leads from Las Vegas via the silver mining town Calico and through the Mojave Desert to Barstow. Your motorcycle tour ends on the last leg from Barstow to Los Angeles, where you start your individual journey back home.